Bu çalışmada, kuru kesme şartlarında tornalanmış ve küreselleştirme ısıl işlemi uygulanmış AISI 1050 çeliğinin esas kesme kuvvetlerini tahmin etmek için yapay sinir ağları (YSA) modeli oluşturulmuştur. Oluşturulan YSA modelinde kesme hızı, ilerleme ve ısıl işlem süreleri bağımsız değişkenler olarak seçilirken esas kesme kuvvetleri bağımlı değişken olarak seçilmiştir. Bu modelin özellikleri; ağ tipi olarak ileri beslemeli geri yayılımlı ağ tipi, üç adet eğitim algoritması TRAINLM, BFGS ve SCG, adaptasyon öğrenme fonksiyonu LEARNGD ve 1 adet gizli katmanda 10 nörondan 15 nörona kadar seçilip denenerek en iyi R2 aranmıştır. Ayrıca transfer fonksiyonu olarak SIGMOID ve PURELINE transfer fonksiyonları seçilmiştir. Ortalama hatalar kareleri yöntemi kullanılarak esas kesme kuvveti için elde edilen YSA modelinde R2 %99,832 elde edilmiştir. Deney sonuçları ve elde edilen YSA modelinin deney verilerini tahmin etmede başarılı olduğu görülmüştür. Finn, M.E., (1989). Metals Handbook, Ninth edition, Volume:16, Machining, ASM International, Ohio, USA, pp:666–680. Kamyabi-Gol, A. and Sheikh-Amiri, M., (2010). Spheroidizing Kinetics and Optimization of Heat Treatment Parameters in CK60 Steel Using Taguchi Robust Design. Journal of Iron and Steel Research, Volume:17, Number:4, pp:45–52. Gunay, M., Aslan, E., Korkut, I., and Ulvi, S., (2004). Investigation of The Effect of Rake Angle on Main Cutting Force. International Journal of Machine Tools and Manufacture, Volume:44, Number:9, pp:953–959. Ferna´ndez-Abia, A.I., Barreiro, J., Lopez de Lacalle, L.N., and Martinez, S., (2011). Effect of Very High Cutting Speeds on Shearing, Cutting Forces and Roughness in Dry Turning of Austenitic Stainless Steels, The International Journal of Machine Tools and Manufacture, Volume:57, pp:61–71. Totis, G. and Sortino, M., (2011). Development of A Modular Dynamometer for Triaxial Cutting Force Measurement in Turning. The International Journal of Machine Tools and Manufacture, Volume:51, pp:34–42. Kuram, E., Cetin, M.H., Ozcelik, B., and Demirbaş, E., (2012). Performance Analysis of Developed Vegetable-Based Cutting Fluids by D-optimal Experimental Design in Turning Process. Internatinaol Journal of Computer Integred Manufacture, Volume: 25, Number:12, pp:1165–1181. Camposeco-negrete, C., (2015). Optimization of Cutting Parameters Using Response Surface Method for Minimizing Energy Consumption and Maximizing Cutting Quality in Turning of AISI 6061 T6 Aluminum. Journal of Cleaner Production, Volume:91, pp:109–117. Kwon, Y. and Fischer, G.W., (2000). Fuzzy Neuron Adaptive Modeling to Predict Surface Roughness Under Process Variations in CNC Tourning. Number:1, pp:440–450. Philip Selvaraj, D., Chandramohan, P., and Mohanraj, M., (2014). Optimization of Surface Roughness, Cutting Force and Tool Wear of Nitrogen Alloyed Duplex Stainless Steel in A Dry Turning Process Using Taguchi Method. Measurement, Volume:49, pp:205–215. Zain, A.M., Haron, H., and Sharif, S., (2010). Prediction of Surface Roughness in The End Milling Machining Using Artificial Neural Network. Expert Systems with Applications, Volume:37, pp:1755–1768. Venkata, Rao, K., Murthy, B.S.N., and Mohan Rao, N., (2014). Prediction of Cutting Tool Wear, Surface Roughness and Vibration of work Piece in Boring of AISI 316 Steel with Artificial Neural Network. Journal of The International Measurement Confederation, Volume:51, pp:63–70. Sreenivasulu, R., (2013). Optimization of Surface Roughness and Delamination Damage of GFRP Composite Material in End Milling Using Taguchi Design Method and Artificial Neural Network. Procedia Engineering, Volume:64, pp:785–794. Karayel, D., (2009). Prediction and Control of Surface Roughness in CNC Lathe Using Artificial Neural Network. Journal of Materials Processing Technology, Volue:209, pp:3125–3137. Nalbant, M., Gökkaya, H., Toktaş, I., and Sur, G., (2009). The Experimental İnvestigation of the Effects of Uncoated, PVD- and CVD-Coated Cemented Carbide Inserts and Cutting Parameters on Surface Roughness in CNC Turning and İts Prediction Using Artificial neural Networks. Robotics and Computer-Integrated. Manufacturing, Volume:25, pp:211–223. Beatrice, B.A., Kirubakaran, E., Thangaiah, P.R.J., and Wins, K.L.D., (2014). Surface Roughness Prediction Using Artificial Neural Network in Hard Turning of AISI H13 Steel with Minimal Cutting Fluid Application. Procedia Engineering, Volume:97, pp:205–211. Zain, A.M., Haron, H., Qasem, S.N., and Sharif, S., (2012). Regression and ANN models for estimating minimum value of machining performance, Applied Mathematical Modelling, Volume:36, pp:1477–492. Korkut, I., Acir, A., and Boy, M., (2011). Application of Regression and Artificial Neural Network Analysis in Modelling of Tool-Chip İnterface Temperature in Machining. Expert Systems with Applications, Volume:38, pp:11651–11656. Asiltürk, İ. and Çunkaş, M., (2011). Modeling and Prediction of Surface Roughness in Turning Operations Using Artificial Neural Network and Multiple Regression Method. 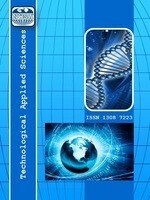 Expert Systems with Applications, Volume:38, pp:5826–5832. Kara, F., Aslantas, K., and Çiçek, A., (2014). ANN and Multiple Regression Method-Based Modelling of Cutting Forces in Orthogonal Machining of Aısı 316l Stainless Steel. Neural Computer Application, Volume:26, Number:1, pp:237–250. Delgrange, V.N., Cabassud, N., Cabassud, M., Durand-Bourlier, L., and Laine, J.M., (1998). Neural Networks for Prediction of Ultrafiltration Transmembrane Pressure: Application To Drinking Water Production. Journal of Membrane Science. pp:111–123. Demuth, H., Beale, M., and Hagan, M., (2007). Neural Network Toolbox 5: Users Guide. Natick, MA, The MathWorks Inc.
ISNAD BADAY, ŞEHMUS . "KÜRESELLEŞTİRME ISIL İŞLEMİ UYGULANMIŞ AISI 1050 ÇELİĞİN TORNALANMASINDA ESAS KESME KUVVETLERİNİN YAPAY SİNİR AĞLARI İLE MODELLENMESİ". Technological Applied Sciences 11 / 1 (January 2016): 1-9.